The following article is the second of a three-part article series that presents definitions and samples for different Object-Oriented Programming (OOP) concepts and its implementation in .NET. The first part examined the concepts of classes, objects, and structures. This part examines the concepts of inheritance, abstraction, and polymorphism. The third and last part will examine the concepts of interface, multiple interface inheritance, collections, and overloading. In Part 1 of Object-Oriented Programming Concepts and .NET, I defined the concepts of class, object, and structure. In addition to defining the concepts, I explained real world samples and presented sample code in C# and VB.NET to create classes and structs. The first article also explains objects as independent building blocks. In Part 2 of Object-Oriented Programming Concepts and .NET, I will explain the concepts of inheritance, abstraction, and polymorphism. I will also present a Unified Model Language (UML) class diagram to represent an object model that will help as a visual aid to explain some concepts. The purpose of this article is to explain a series of relationships between objects. In the real world there are many objects that can be specialized. In OOP, a parent class can inherit its behavior and state to children classes. This concept was developed to manage generalization and specialization in OOP and is represented by a is-a relationship. The concept of generalization in OOP means that an object encapsulates common state and behavior for a category of objects. The general object in this sample is the geometric shape. Most geometric shapes have area, perimeter, and color. The concept of specialization in OOP means that an object can inherit the common state and behavior of a generic object; however, each object needs to define its own special and particular state an behavior. In Figure 1, each shape has its own color. Each shape has also particular formulas to calculate its area and perimeter. Inheritance makes code elegant and less repetitive. If we know that all shapes have color, should we program a color attribute for each shape? The answer is no! Would it be a better idea to create a shape class that has a color attribute and to make all the specialized shapes to inherit the color attribute? The answer is yes! The Shape class is the parent class. 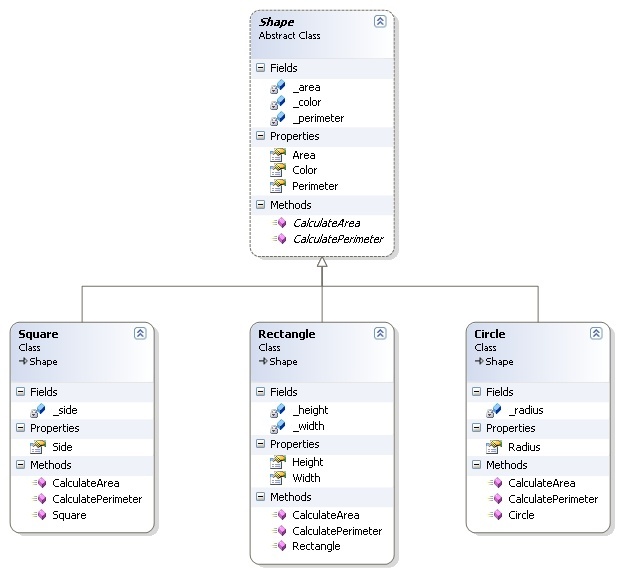 Square, Rectangle, and Circle are derived classes that inherit from Shape. The triangle-connector in the diagram represents an is-a relationship. The .NET framework has many base classes. Everything is derived from System.Object. You can create almost anything you imagine using the built-in functionality provided in the .NET Framework Class Library. Multiple inheritance is the possibility that a child class can have multiple parents. Human beings have always two parents, so a child will have characteristics from both parents. In OOP, multiple inheritance might become difficult to handle because it allows ambiguity for the compiler. There are programming languages such as C++ that allow multiple inheritance; however, other programming languages such as Java and the .NET Framework languages do not allow multiple inheritance. Multiple inheritance can be emulated in .NET using Multiple Interface Inheritance, which I will explain in Part 3 of this series. A sealed class is a class that does not allow inheritance. Some object model designs need to allow the creation of new instances but not inheritance, if this is the case, the class should be declared as sealed. Abstraction is "the process of identifying common patterns that have systematic variations; an abstraction represents the common pattern and provides a means for specifying which variation to use" (Richard Gabriel). An abstract class is a parent class that allows inheritance but can never be instantiated. Abstract classes contain one or more abstract methods that do not have implementation. Abstract classes allow specialization of inherited classes. Figure 2 shows a Shape class, which is an abstract class. 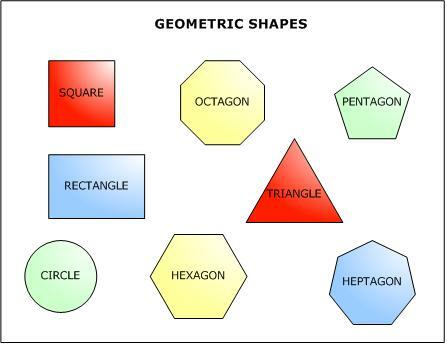 In the real world, you never calculate the area or perimeter of a generic shape, you must know what kind of geometric shape you have because each shape (eg. square, circle, rectangle, etc.) has its own area and perimeter formulas. The parent class shape forces all derived classes to define the behavior for CalculateArea() and CalculatePerimeter(). Another great example is a bank account. People own savings accounts, checking accounts, credit accounts, investment accounts, but not generic bank accounts. In this case, a bank account can be an abstract class and all the other specialized bank accounts inherit from bank account. Polymorphism allows objects to be represented in multiple forms. Even though classes are derived or inherited from the same parent class, each derived class will have its own behavior. Polymorphism is a concept linked to inheritance and assures that derived classes have the same functions even though each derived class performs different operations. Figure 2 shows a Rectangle, a Circle, and Square. All of them are shapes and as shapes their area and perimeter can be calculated; however, each shape calculates its area in a specialized way. Declaring a member as abstract allows polymorphism. The Shape class defines the CalculateArea() and CalculatePerimeter() methods as abstract, this allows each derived class to override the implementation of the parent's methods. The virtual keyword allows polymorphism too. A virtual property or method has an implementation in the base class, and can be overriden in the derived classes. Overriding is the action of modifying or replacing the implementation of the parent class with a new one. Parent classes with virtual or abstract members allow derived classes to override them. Inheritance allows developers to manage a generalization and specialization relationship between objects. OOP concepts such as abstraction and polymorphism help to define better object models where object hierarchies are designed with reusability in mind. In this article, I examined the concept of inheritance, abstraction, and polymorphism. The third and last part of this series will examine the concepts of interface, multiple interface inheritance, collections, and overloading. The sample source code* for this article works only in Visual Studio 2005. Matt Weisfeld, The Object-Oriented Thought Process, SAMS, 2000. Robin A. Reynolds-Haertle, OOP with Microsoft Visual Basic .NET and Microsoft Visual C# .NET Step by Step, Microsoft Press, 2002.